MSNBC's Thomas Roberts talks with University of Washington Center for Game Science director Seth Cooper and researcher Firas Khatib about a video game that helped unravel a protein structure in an AIDS-like virus. "This is one small piece of the puzzle in being able to help with AIDS," Firas Khatib, a biochemist at the University of Washington, told me. Khatib is the lead author of a research paper on the project, published today by Nature Structural & Molecular Biology. The feat, which was accomplished using a collaborative online game called Foldit, is also one giant leap for citizen science — a burgeoning field that enlists Internet users to look for alien planets, decipher ancient texts and do other scientific tasks that sheer computer power can't accomplish as easily. "People have spatial reasoning skills, something computers are not yet good at," Seth Cooper, a UW computer scientist who is Foldit's lead designer and developer, explained in a news release. "Games provide a framework for bringing together the strengths of computers and humans." For more than a decade, an international team of scientists has been trying to figure out the detailed molecular structure of a protein-cutting enzyme from an AIDS-like virus found in rhesus monkeys. Such enzymes, known as retroviral proteases, play a key role in the virus' spread — and if medical researchers can figure out their structure, they could conceivably design drugs to stop the virus in its tracks. The strategy has been compared to designing a key to fit one of Mother Nature's locks. The problem is that enzymes are far tougher to crack than your typical lock. There are millions of ways that the bonds between the atoms in the enzyme's molecules could twist and turn. To design the right chemical key, you have to figure out the most efficient, llowest-energy configuration for the molecule — the one that Mother Nature herself came up with. That's where Foldit plays a role. The game is designed so that players can manipulate virtual molecular structures that look like multicolored, curled-up Tinkertoy sets. The virtual molecules follow the same chemical rules that are obeyed by real molecules. When someone playing the game comes up with a more elegant structure that reflects a lower energy state for the molecule, his or her score goes up. If the structure requires more energy to maintain, or if it doesn't reflect real-life chemistry, then the score is lower. The monkey-virus puzzle was one of several unsolved molecular mysteries that a colleague of Khatib's at the university, Frank DiMaio, recently tried to solve using a method that took advantage of a protein-folding computer program called Rosetta. "This was one of the cases where his method wasn't able to solve it," Khatib said. Fortunately, the challenge fit the current capabilities of the Foldit game, so Khatib and his colleagues put the puzzle out there for Foldit's teams to work on. "This was really kind of a last-ditch effort," he recalled. "Can the Foldit players really solve it?" They could. "They actually did it in less than 10 days," Khatib said. One floppy loop of the molecule, visible on the left side of this image, was particularly tricky to figure out. 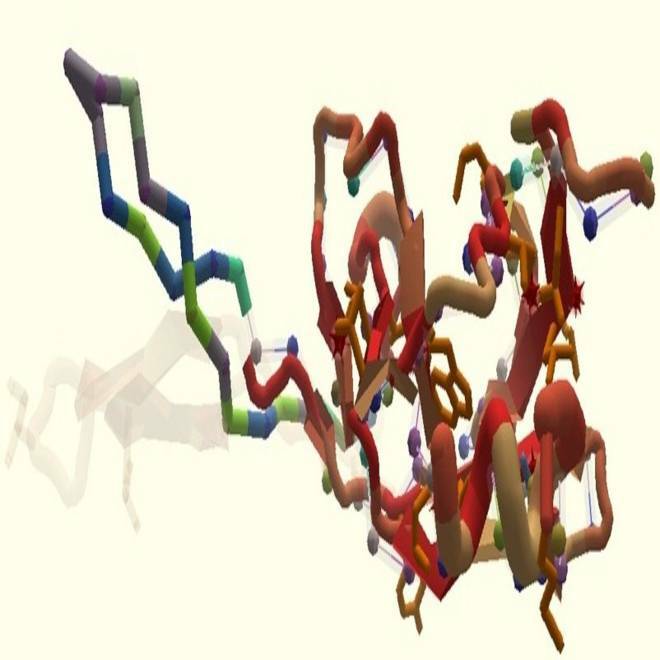 But players belonging to the Foldit Contenders Group worked as a tag team to come up with an incredibly elegant, low-energy model for the monkey-virus enzyme. "Standard autobuilding and structure refinement methods showed within hours that the solution was almost certainly correct," the researchers reported in the paper published today. "Using the Foldit solution, the final refined structure was completed a few days later." Khatib said the Seattle team's collaborators in Poland were in such a celebratory mood that they insisted on organizing a simultaneous champagne toast, shared over a Skype video teleconference. "Although much attention has recently been given to the potential of crowdsourcing and game playing, this is the first instance that we are aware of in which online gamers solved a longstanding scientific problem," Khatib and his colleagues wrote. The parts of the molecule that formed the floppy loop turned out to be of particular interest. "These features provide exciting opportunities for the design of retroviral drugs, including AIDS drugs," the researchers said. The monkey-virus puzzle solution demonstrates that Foldit and other science-oriented video games could be used to address a wide range of other scientific challenges — ranging from drug development to genetic engineering for future biofuels. "My hope is that scientists will see this research and give us more of those cases," Khatib said. He's not alone in that hope. "Foldit shows that a game can turn novices into domain experts capable of producing first-class scientific discoveries," Zoran Popovic, director of University of Washington's Center for Game Science, said in today's news release. "We are currently applying the same approach to change the way math and science are taught in school." That's something that Carter Kimsey, program director for the National Science Foundation's Division of Biological Infrastructure, would love to see happen. "After this discovery, young people might not mind doing their science homework," she quipped. One caveat, though: Playing Foldit isn't exactly like playing Bejeweled. "Let's be honest, proteins aren't the sexiest video game out there," Khatib told me. Give the game a whirl, and let me know whether it's addictive or a drag. "I have been playing Foldit for nearly three years, and I have been in the Contenders team for two and a half years. "Although there are 35 names on the members list on the website, when you take off duplicate names and non-active players, it comes down to about 12 to 15 people. "The team members come from a wide range of backgrounds, chiefly scientific or IT [information technology], although our best player is from neither. "One of the main features of Foldit is the ability to communicate via chat within the game. There is both global chat, which everyone can access, and individual group chat, which allows team members to talk easily to one another. The Contenders are spread out between Canada, USA, UK, Europe and New Zealand, so this is essential. "Each player can work on a solo solution to a puzzle, but we can also exchange solutions between the team and add our own improvements to achieve a better result. Often the evolved solution for a team scores higher than the top solo score. "The game is not only an interesting intellectual challenge, allowing you to use your problem-solving skills, 'feel' for protein shapes, and whatever biochemical knowledge you have to obtain a solution to each puzzle, but it also provides a unique society of players driven by both individual and team rivalry with an overall purpose of improving the game and the results achieved. A body of knowledge has been built up in the Wiki by contributions from players, and ideas are constantly fed back to the game designers. "In the case of the Mason-Pfizer monkey virus, I had looked at the structure of the options we were presented with and identified that it would be better if the 'flap' could be made to sit closer to the body of the protein — one of the basic rules of folding is to make the protein as compact as possible — but when I tried this with my solo solution, I couldn't get it to work. However, when I applied the same approach to the evolved solution that had been worked on by other team members, I was able to get it to tuck in, and that proved to be the answer to the structure. I believe that it was the changes made by my colleagues that enabled mine to work, so it was very much a team effort. "We were all very excited to hear that we had helped to find the answer to this crystal form, especially since it had been outstanding so long and other methods had been unsuccessful. The feeling of having done something that could make a significant contribution to research in this field is very special and unexpected. Foldit players have achieved a number of successes so far, and I hope we will go on to make many more. "You may be aware that we asked for accreditation for the Foldit Contenders Team within the article, rather than being named individually. "Many of the people playing the game are known only by their user name, even within a team. "I would be grateful if you could refer to me as 'mimi' rather than using my full name." "We are all very excited about the discovery, to see the story unfold now is very gratifying. The main motivator of the Contenders group, and most Foldit players for that matter, is the advancement of science. It is very typical for mimi not to have her real name listed or even to claim the discovery as her own. "Contenders is a group of like-minded individuals. The strength lies in comradeship, cooperation and perseverance. Most of us have been 'folding' for several hours each day over the past years. "To be part of this adventure is a very fulfilling experience. Quite a few of us have or have had family members who suffered from the modern terminal diseases and find energy in those experiences to keep folding with the intention to make a difference." In addition to Khatib, DiMaio, Cooper, Popovic and the Foldit Contenders Group, the authors of "Crystal Structure of a Monomeric Retroviral Protease Solved by Protein Folding Game Players" include the Foldit Void Crushers Group, Maciej Kazmierczyk, Miroslaw Gilski, Szymon Krzywda, Helena Zabranska, Iva Pichova, James Thompson, Mariusz Jaskolski and David Baker. The authors also acknowledged "the members of the Foldit team for their help designing and developing the game and all the Foldit players and Rosetta @ home volunteers who have made this work possible." The work was supported by UW's Center for Game Science, the Defense Advanced Research Projects Agency, the National Science Foundation, the Czech Ministry of Education, the Howard Hughes Medical Institute and Microsoft Corp. (Msnbc.com is a joint venture involving Microsoft and NBC Universal.) Foldit was created by computer scientists at the Center for Game Science in collaboration with the UW's Baker Laboratory.